The obituary of John Luft from the Warsaw, Hancock County, Illinois, newspaper of 24 June 1921 indicated that he was born in “Grossehertzgotum,” Hessen, Germany. 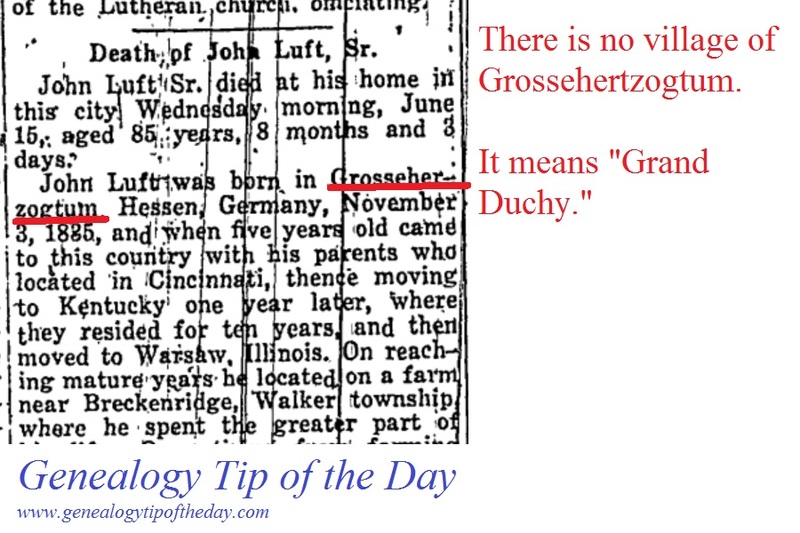 It refers to the Grand Duchy of Hesse–not a specific village. James Beidler tells of a researcher who looked for this village for years in his Trace Your German Roots Online: A Complete Guide to German Genealogy Websites. All of which make the point: ask, learn, and don’t assume. It’s easy to be confused about locations in an area where you don’t know the language, where you don’t know the geography, and where you never lived. German research has been my stumbling block. For locations I head directly to https://www.meyersgaz.org/. I love maps and I almost always look up places I find while researching. Often it will help me decide if I have the right John Smith. There are a lot of German genealogy groups out there on Facebook for example that will help with translation and location. The name was Grossherzogtum or Großherzogtum. If the spelling had been correct it would have been easier to figure out that it wasn’t a specific town. Also if you have a location for your ancestor in Germany, make sure to get to know the area. A lady recently contacted me via ancestry asking for help for her German Grandfather. I ended up contacting one of the German city archive in that area to ask where she could obtain the birth certificate, as I wasn’t familiar with the area and looking at websites and maps I couldn’t quite figure out the correct city to write too. I did get an answer and forwarded the address to this lady. In general I feel people are afraid to try to contact a archive in another country. In Germany most archives will answer in English, so once you have a specific area, give it a try. If they answer in German, find someone who can translate it. Good advice, Yvonne. Thanks for posting it.